THIS week’s property review includes this wrap-up of interesting recent listings across the country, and a separate article on recently-completed sales of note. After 110 years of Green family ownership, the highly regarded Coonamble properties Trewilga and Punches Plain are being put to the market via an expression of interest campaign through Colliers International. Located 61km north west of Coonamble and 230km from Dubbo in central western New South Wales, 5685ha Trewilga, together with the more recently acquired 2282ha Punches Plains, span 7967ha. They comprise 5685ha of freehold black self-mulching soils and 1740ha of cultivation, making them suitable for breeding or fattening cattle and/or sheep, as well as a prime hard wheat producing enterprise. The country is level to slightly undulating natural flood plain that is susceptible to beneficial flooding from the Nedgera and Mowlma Creeks and the soils are mostly heavy grey flood-out, together with small areas of red loam. Water is also secured by four bores and double frontage to the Nedgera Creek. First settled in 1909 and held continuously since that time, Bill and Lenore Green have decided to retire closer to Coonamble. Historically, the vendors have run a 4500 Merino ewe breeding enterprise, supplemented with 3000 agistment cattle (when the opportunity permits) and 1740ha of cultivation on a full moisture profile. Selling agent Mike Clifton said Trewilga boasts high quality improvements. Trewilga and Punches Plain are being sold bare of stock with EOI closing on April 17. Mr Clifton said they can be sold as one, or alternatively individually and not being contingent upon one another. Trewilga and Punches Plain are being sold bare of stock with EOI closing on April 17. After more than a century of ownership, fourth-generation Queensland beef producer Peter Magoffin has decided to offload his two central western Queensland properties. Melrose Aggregation, 130km west of Longreach, has been held by the family for 148 years. With a carrying capacity of 3000 adult equivalents, it would be suitable as a standalone operation for breeding and backgrounding, or as a depot for a larger breeding operation. 11,957ha Melrose Station – a freehold block that is predominately open Mitchell grass downs. 19,500ha Werite (leasehold) comprising mulga tableland. 41,590ha Highfields/Yandilla (leasehold) – Highfields is gidgee mulga while most of Yandilla is open undulating downs country running back to mulga and gidgee ridge country. The properties are watered by the Maneroo and Katherine creek channels, as well as 26 dams and three bores. Over recent years, there have been extensive improvements to the troughs, tanks and water pipeline. Melrose Aggregation, 130km west of Longreach, has been held by the Magoffin family for 148 years. Wally Cooper from Rural Property & Livestock, who has been charged with selling both Melrose and Tonkoro Stations, said Melrose offers diversity and security with a good balance of shaded and open downs, creek country, gidyea and the added safety of mulga reserves. Tonkoro is a large-scale breeding, backgrounding and fattening operation, 245km south west of Winton and 240km west of Longreach. It’s the first time in 118 years that the property has been offered for sale. Comprising the 70,800ha Carcara and 67,340ha Tonkoro, the country is open soft mulga country interspersed with channels and open bluebush swamps filled with salines and herbages providing excellent weight gain ability. Tonkoro is currently running 4000 cows and calves plus replacement heifers, however it has run more than 5000 cows and progeny. Over the last six years, 34km of boundary fencing has been erected alongside the neighbouring property Connemarra and more recently, over $2m has been spent on capital improvements. The 13 dams have been recently cleaned out and of the 16 bores and wells, eight are new and all tanks and troughs have been equipped with solar operated pumps. There are numerous channel systems on Tonkoro including Farrahs, Middle and New Year creeks. Recently, the property was registered for a 25-year carbon project. RPL’s Wally Cooper has another two properties, recently listed, for sale in central western Queensland, but he said it wasn’t the rain that facilitated the offerings. “The vendors have been considering selling their properties for some time,” he said. Upshot is a 12,812ha block that is well grassed with Mitchell downs interspersed with gidgee, 130km south west of Longreach. It is watered by six dams and four waterholes. It is owned by Barry and Tanya Dawson who have bought elsewhere. Mr Cooper believes the potential buyer will be a farming family seeking a standalone operation or expansion block. Glendon, situated 90km south west of Longreach, offers the incoming purchaser a multiple of options. 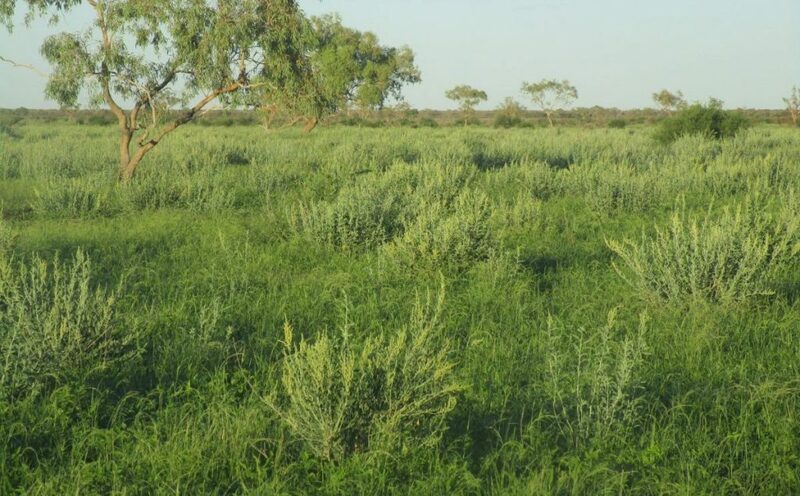 Carrying Mitchell grass, mulga, senna and eremophila bushes, the 4878ha would suit cattle, sheep, and/or goat production as an easy care, low cost operation. The property can carry 400 adult equivalents, is cluster fenced on two sides for wild dogs, and is watered by an artesian bore and two permanent dams. Peter MacPherson from Ruralco Property Qld has two North Queensland listings that have received excellent rainfall this season and are in a strong position going into 2019. Hillsborough is a well-located coastal hinterland breeding property at Ravenswood, 125km south west of Townsville. It is being offered for sale for $12m walk-in, walk-out with extensive and high-quality plant plus 4850 head of mixed cattle, although the vendors will sell the property bare of stock if preferred. Pat and Jennifer Williams have undertaken an extensive program of improvements over the past three years including fencing, gateways and assemblies, laneways, main road fenced, three new paddocks and more than 100km of new roads which have greatly improved access. Water developments include seven new bores and new solar units to tanks and troughs. This has resulted in opening up new country and increasing carrying capacity. Mr MacPherson said there has been strong interest due to the good rain and good grass. “It’s come particularly from locals (within a 400km radius) seeking expansion or from producers interested in establishing their first breeding operation in a reliable area, close to Townsville,” he said. In the meantime, the Williams’ will downsize to their smaller property at Charters Towers. There’s been a strong response to the tightly-held western grazing operation Marmboo, which will be auctioned by Ruralco on April 4. Situated near Vergemont, 92km west of Longreach, it has had two owners since World War Two, with Brendan and Deborah McAuliffe selling up to pursue other interests. The 38,558ha block is suitable for both cattle and sheep and is rated to carry 18,000 DSE or cattle equivalent. The property is also being offered with another 2023ha of stock route. The country is mainly undulating open downs, consisting of 25,000ha of very good grassed country, more than 10,000ha of slightly lighter and not as quick to respond country, and 6000ha of slightly lesser quality country. A strong feature of the property is its water security which the present owners have recently upgraded. There are bores, troughs and tanks, as well as 15 dams. Marmboo is currently destocked and as a result the Mitchell, Flinders and buffel grasses are responding well to the solid rainfall received in December and again in February. Mr MacPherson said interest has come from a wide area, from across Queensland and as far south as Griffith in New South Wales. Two neighbouring grazing blocks carrying a large body of feed in north Queensland are attracting good interest from grass-hungry producers. 3160ha Granitevale and 3718ha Laudham Park are breeding and backgrounding properties situated around 30 minutes from Townsville, above the Ross River Dam. Granitevale is watered by eight creeks which have permanent holes and springs, with potential to irrigate. Laudham Park has 10 unequipped bores. Both have irrigation potential. The vendors have decided to sell up so they can purchase a bigger beef enterprise. Gary Johns from Landmark Harcourts Mackay said the properties are attractive for anyone chasing feed. Granitevale and Laudham Park can be purchased as a whole or as separate properties with expressions of interest closing on April 29. A 515ha property with all the facilities for a 1000 head beef feedlot in central western New South Wales is being offered by Landmark Harcourts Forbes. Selling agent Ainslie Toole said the newly listed Wilbidgee operation, owned by Matthew Linsdell and Naomi Wallace, previously had development application approval. “As a result, this has generated good interest from offshore buyers, producers looking to diversify and large grain enterprises looking to value add,” she said. Located 30 minutes to one of the state’s largest livestock selling centres, the Wilbidgee beef feedlot complex features a pad for the pens plus five sileage pits (125m x 21m) and 438ha of cultivation in a 525mm average district rainfall area. 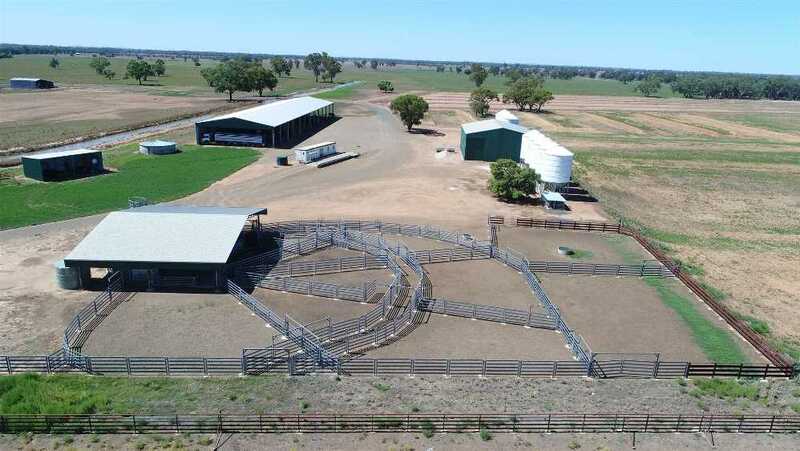 There is a 400 head cattle yard with an undercover working area, a concrete race, hay and bulk feed sheds and most of the fencing is in excellent condition. Soils on Wilbidgee are a mix of red loams and alluvial heavy clay loams, and the shelter trees are mainly Yellowbox, Box and Rivergums. Almost 150ha is irrigated, with around half featuring naturally productive trefoil alluvial flood plains. Stock and domestic water is supplied by a bore and 510 ML from Jemalong Irrigation. Based on other sales, the property’s infrastructure and the water licence included, Ms Toole is expecting interest at $5m, but admits the sale price could rise.